This week's post is about something I bought on eBay rather than something I found myself. I prefer to find things myself but I saw this and I quite liked it and it's quite unique because you don't often see a roe deer with three antlers. I really like bones (and antlers) that have grown strange because it makes me the only one in the world with something like that. Some of my favourite bones are a broken front leg, a broken femur, a broken tibia, a red deer with only one antler, a deer with three legs (that I haven't written about yet), and lots of others like the golden eagle with the skull injury and the shotgun pellet hole. This wasn't the skull I most wanted, though. 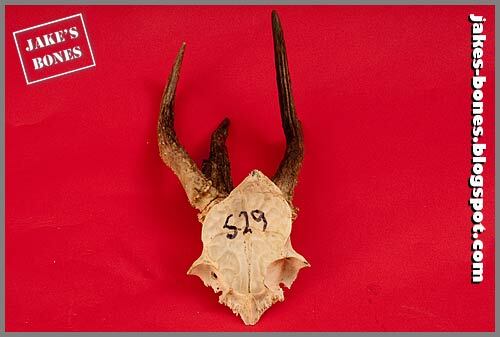 I was bidding on this one with an antler than looked floppy (it wouldn't have been, though) and I really really wanted but the price got well too high. It sold for £41 which is a lot for one skull. After that one ended I saw another being sold by the same seller that no-one else had bid on. I got that one for £5.50 plus postage ! The person selling it was in Scotland too and it arrived after a few days. It is pretty awesome ! 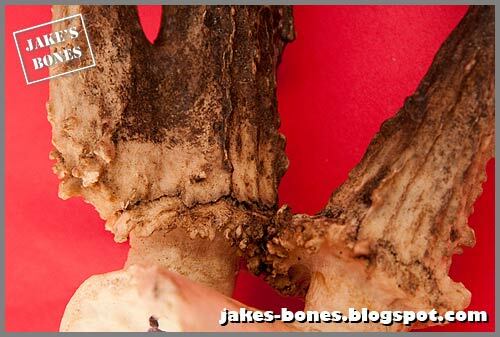 I wrote a big article on how roe deer antlers grow about two years ago and it is really popular. 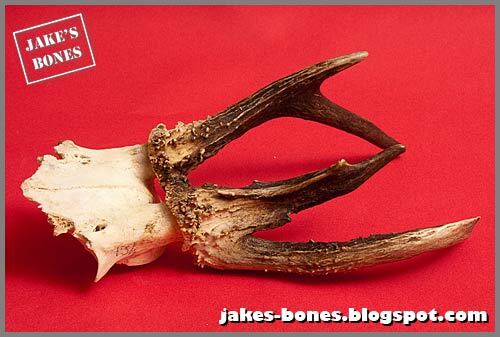 Roe deer antlers start growing in December, and the antlers grow slowly fron the two bone pedicles on top of the skull. They are covered in 'velvet' (fur) while they grow, then the velvet falls off and the antlers are hard. By November the antlers fall off again and a new set grow. If the antlers are damaged while they are in velvet they can grow to be mishapen, like the roe buck I wrote about here which had a broken antler. Sometimes the antlers grown strangely anyway, like the roe deer antler which I have which has four tines (not three). 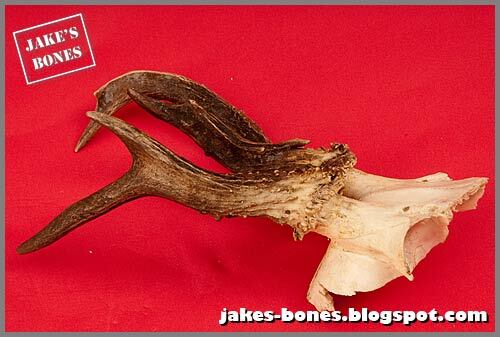 What has happened is that the left antler has split at the bottom into two branches. 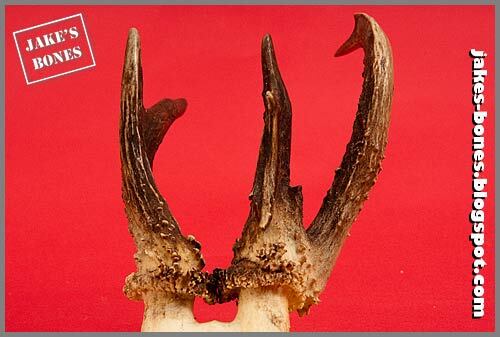 The seller thought the antler had been split while in velvet so it grew strangely. The skull has been cut off as if it was going on a shield. It has a number on but I don't know what the number means. I don't often see inside a braincase but you can see lots of squiggly lines where the brain was. 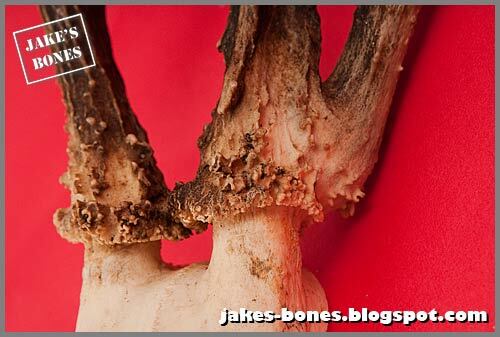 There is what looks like a crack at the bottom of the left antler but the antler is still strong. It must have looked awesome if you saw it in the woods without knowing what happened. Maybe that's why someone shot it for the antlers which is a bit sad. The deer probably never even realised it had three antlers ! Very interesting, Jake! That skull that you missed out on looks really amazing, it was a good idea to save a capture of the eBay listing to remind you of it. I think that in more 'managed' deer herds such as Red Deer or the Fallow Deer that you get in deer parks, stags and bucks get culled if they have deformed antlers, the theory being that the animals with the best antlers have the best chance of producing healthiest offspring, and the imperfect animals will pass abnormality on to their young. I'm not sure that sort of population management happens to the same extent with 'wilder', less commercially valuable deer such as Roe. 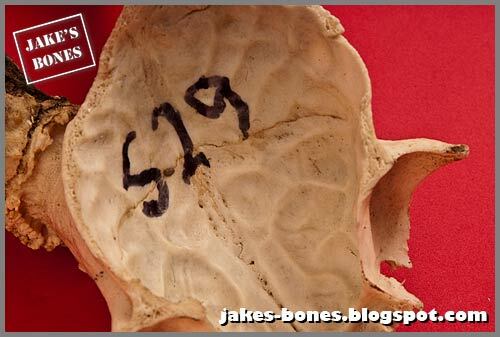 As you say, it is interesting to see the inside of the brain case on this specimen. I must hurry up and send you that email about endo-cranial casts that I promised! Thats one cool antler, indeed! To get a "one of a kind" antler is still on my wishlist, too. And, as a bone collector, you can not find everthing by yourself. It's nothing bad about to buy a skull or an antler. But it should be all legal. Hi Donkey_b ! That's a cool find ! I don't think it is really three horns.Looks more like a tine was growing at the base of the horn. It still is very cool. @Anonymous: I do say that in the blog post.